Pack size: 20 x sterile wipes. 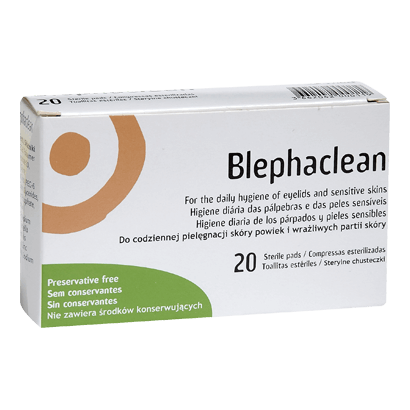 Blephaclean, produced by Spectrum Thea, is a popular product used to treat the eye condition Blepharitis. Symptoms associated with this condition include consistent eye inflammation, along the lower part of the eyelids. Those suffering from Blepharitis, will experience soreness and irritation. Blephaclean wipes help to soothe and reduce the effects of inflammation, while assisting in the repairing of tissues. The formula is very gentle on the skin, being free of preservatives and perfumes. Each box of Blephaclean contains 20 handy wipes that are very convenient and easy to use. Blephaclean formula is comprised of 3 natural ingredients, Hyaluronic acid, Centella Asiatic and Isis Florentina. Hyaluronic acid is a naturally hydrating component that helps repair. Centella Asiatic stimulates the production of collagen and cornea connective tissues. Isis Florentina naturally eases inflammation. All ingredients combined, help smooth, hydrate and replenish the skin. Simply take a wipe and run it along your eyelid, paying attention to the lower eyelash area. Use a fresh wipe for the other eye, to gently clean and soothe. There is no need to rinse your eyes once done either and you'll receive the best results when you use the wipes twice daily, in the morning and at night. These sterile wipes are also ideal for removing your eye make-up and the box fits nicely into standard sized handbags, allowing you to carry them around with you.